This guide provides an overview of the quick tips for creating fault tree diagrams and offers a directory of some other resources on the subject. The method of fault tree analysis (FTA) was first introduced by Bell Laboratories, it is one of the most widely used methods nowadays. It is a diagram that displays the state of a system (top event) in terms of the states of its components (basic events). So in other words, fault tree diagrams are a graphical design technique to determine the causes of a possible failure or to test the stability of a system by through a logical analysis. Fault tree diagrams can be used in engineering as well as software development area, especially in those areas where failure can lead to massive consequences. 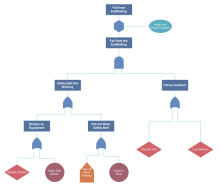 Here are some quick tips to create an effective and efficient fault tree diagram. 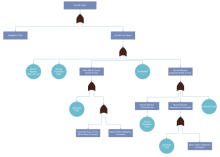 This step involves with several basic fault tree symbols and the key is to use them wisely. 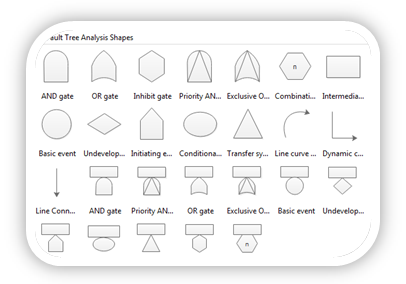 Edraw, a professional fault tree diagram software, provides all standard fault tree symbols for any situations. Use the event symbols to construct a clear and concise fault tree diagram. The logic gates used should be restricted to "AND gate" and "OR gate", and use them only when necessary. For example, use the "oval constraint symbol" to illustrate a necessary order of events that must happen to have an event occur. The transfer triangle should be used as few times as possible. The more you use transfer triangle, the more complicated the fault tree will become. After all, the aim of fault tree is to keep the procedure as simple and easy-to-follow as possible. Failure of processes while operating. 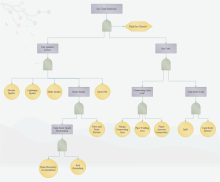 Edraw provides various professional and useful fault tree templates for you to customize your own fault tree diagrams, so you don’t need to worry about where to start. In addition, it will save you tons of time than structure the fault tree diagram yourself. The most important benifit of fault tree is the result data they produce which allow evaluation and improvement of the system. A fault tree helps create a visual illustration of a system which shows the logical relationships between events and causes that lead to possible failure. It enables us to quickly understand the results of the analysis and identify errors so that you can find a way to avoid or improve it. The limitation of fault tree is that it takes a lot time and effort to anticipate and consider all possible causes for potential failures. It is time consuming. The success of the fault tree process depends on the skill and technique of the person who create the diagram.